Maybe fearing the same kind of backlash after users complained about the Kapex when it was introduced to N.A., Festool has suddenly announced that they will not be releasing their Carvex Jigsaw on June 1st. We have no clue what the issues with the jigsaw could be or when we will see the strobing jigsaw again, but it must have been serious enough to cause Festool to pull it and not indicate when it will be reintroduced. This is in no way good news for the company, but it does show that they stand for quality. At Festool we take great pride in delivering the most innovative and useful products available, while applying the highest possible quality standards. Though our tools are used by consumers at many levels, they are ultimately designed for the most demanding professionals, many of whom rely on them for their livelihood. As a premium brand, our customers have extremely high expectations of us, and it is our ceaseless commitment to meet these expectations, oftentimes at great cost and effort. Our unwillingness to compromise means that we sometimes have to make hard choices. With these factors in mind, we have decided not to introduce the Carvex jigsaw to the US and Canadian markets at this time. Late round testing in certain applications specific to North America has demonstrated that the current design does not meet the exacting standards that we demand of ourselves, and that our customers have come to expect. Though we are certain that the Carvex, in its current configuration, would be an excellent tool for nearly any user, we believe that launching it as is would mean compromising many of the values that make us who we are today. For now, we are sorry that we have to disappoint you. 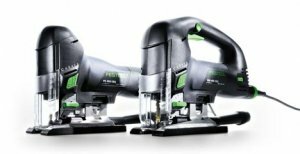 We believe, however, that we would have disappointed a few of you even more, had we introduced a product that didn’t meet the level of quality and precision you have come to rely on from Festool. We will continue to refine the new jigsaw’s design, with the full expectation that the Carvex will be introduced at a later date, executed in a manner that will be satisfying to even the most demanding customer. As this process unfolds, updates will be announced on our website and through our email newsletter. Thank you for your understanding and for your continued support of the Festool Brand.